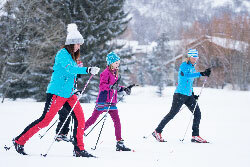 Classic skiing, the traditional “kick-and-glide” technique of Nordic skiing, requires a powerfully smooth motion to be truly efficient. Our Expert instructors will help you achieve this skill, along with balance tips and specific classic skiing techniques. Dial in your kick and enhance your glide to go further with every stride. If you think classic skiing means shuffling slowly around in the woods, you are missing out on a great workout that will have you coming back all winter to explore the twists and turns of our 20K groomed Nordic track. 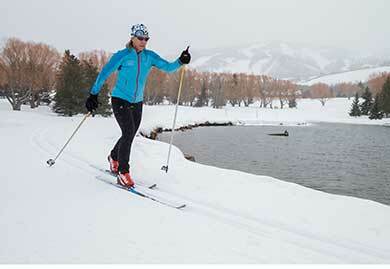 Andrea has been Nordic skiing for over 20 years, and enjoys skate and classic equally. 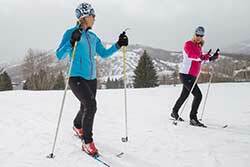 An instructor for both disciplines, Andrea suggests that people who have never skied before take a classic lesson first. “It’s much easier to get proficient in the balance and weight transfer of classic before moving onto skate skiing,” she says. Known for her ability to bring snowshoe and Nordic ski tours to life, Betsy enjoys guiding in the Uinta Mountains which she calls “a great office.” An avid cross country skier, she has raced in the Marcialonga Nordic marathon in Italy, and shares her passion for the sport by teaching classic ski lessons at the White Pine Nordic Center.